Lakeview Tourist Park is located on the waterfront at Long Jetty, only minutes from The Entrance. Ideally situated between Sydney and Newcastle, we are approximately one hour’s drive from either city. We offer accommodation with tent sites, cabins and caravan sites, all at competitive rates. We are situated right at the waterfont of the magnificent Tuggerah lakes and only 5 minutes from pristine surf beaches where you can enjoy all manner of water sports. For those with your own boat, a boat ramp is at our doorstep. Whether you are a local or visitor to the Central Coast, there is no shortage of things to see or do. Activities in the area cater to all ages and budgets. Either take your bike with you or hire one, and enjoy the 12km bicycle path which runs around the lakefront. If you would like any more information, or you would like to make a booking, please contact us. Dunleith caters for all styles of tourist park accommodation. Situated on the lakefront, Dunleith has been owned and operated by the Littlefield family since 1958. Often described as paradise due to its prime location, guests never have a dull moment with some of the best prawning and fishing in the state right at their back door, a pristine surfing beach only seconds walk away and the magnificent tourist attractions of The Entrance only minutes walk away. Some of the park facilities include kiosk / cafe, breakfast delivery service, laundry with irons, washing machines and dryers, games room, shell, shark and historical museum, hot and cold showers, boat ramp, BBQ, boomgate security, and public transport and phones are close by. A stay at Dunleith is one to remember and we know you will come back again and again. Located 90 minutes north of Sydney and 45 minutes south of Newcastle, Norah Head Holiday Park offers the Central Coast’s best surf beach and is in walking distance to the iconic Norah Head Lighthouse. With a range of accommodation options to suit every holiday style and budget, including seven styles of cabins rated from 3 to 4 stars and spacious caravan and camping sites, Norah Head Holiday Park is the perfect location for a beach, fishing or surfing holiday. For the perfect family getaway or a romantic trip away, Toowoon Bay not only features a great mix of sand, surf and shade, but is just minutes from The Entrance. You’ll find all the comforts of home just a few steps away from the quiet serenity of the park’s doorstep. Toowoon Bay Holiday Park is on the headland between two of the Central Coast’s most beautiful beaches, North Shelly and Toowoon Bay. A range of accommodation options are available to suit every holiday style and budget, including ocean front cabins rated from 3½ to 4½ stars, spacious caravans and camping sites. 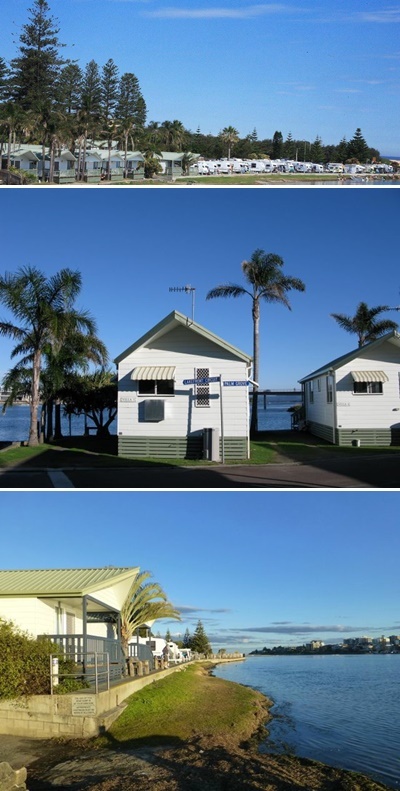 Canton Beach Holiday Park is situated on the foreshore of the tranquil Tuggerah Lake, an interconnecting system of three lakes covering 80 square kilometres with an outlet to the ocean. The park is perfectly located for trekking through the surrounding national parkland and marvelling at the stunning lake system. With a range of accommodation options to suit your holiday style, including six types of 3 to 4 star modern cabins sleeping up to six, as well as spacious caravan and camping sites, Canton Beach Holiday Park is the perfect place for your next relaxing holiday. Budgewoi Holiday Park is a quiet, secluded haven on the foreshore of Lake Munmorah adjacent to some of the Central Coast’s most beautiful beaches and attractions. Lie back and enjoy the park’s shady serenity in the midst of the surrounding paper bark trees. The foreshore and lake, with its bright blue waters, attract fishing enthusiasts and water sports enthusiasts the whole year round. With a range of accommodation options to suit any holiday style, including three types of modern 3½ star cabins sleeping up to six, as well as spacious caravan and camping sites, Budgewoi Holiday Park is the perfect place for your next relaxing holiday.